In September 2018, I attended the Cochrane Colloquium in Edinburgh, Scotland. Here are my tips on making the most of your first Cochrane meeting! Submit an abstract – One of the best ways to get your work noticed is by presenting at conferences like Cochrane. If you are working on a research project that is within the scope of the meetings purview, I would encourage you to submit an abstract to this year’s Cochrane Colloquium. The abstract deadline is April 12, 2019. *Tip: The EQUATOR Network has reporting guidelines for conference abstracts (i.e., PRISMA for Abstracts). The Cochrane website also has a recorded webinar that contains tips for writing a great abstract for Cochrane reviews. Apply for funding – This can be through scholarships, travel grants, or your own university departmental funding. Students are generally eligible for reduced conference rates and may also be apply to apply for a Cochrane stipend to attend the meeting. Create some goals – Write down your reasons for attending the conference and make goals around those reasons. For example, if you are attending the meeting to network with other students and researchers, make a concrete goal to meet with at least 5 new people, exchange contact information, and follow up after the meeting. 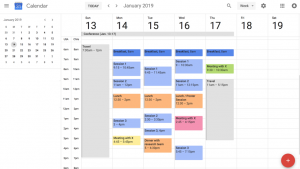 Plan out your sessions and get organized- Once the conference website has posted the meeting schedule, plan out your sessions. 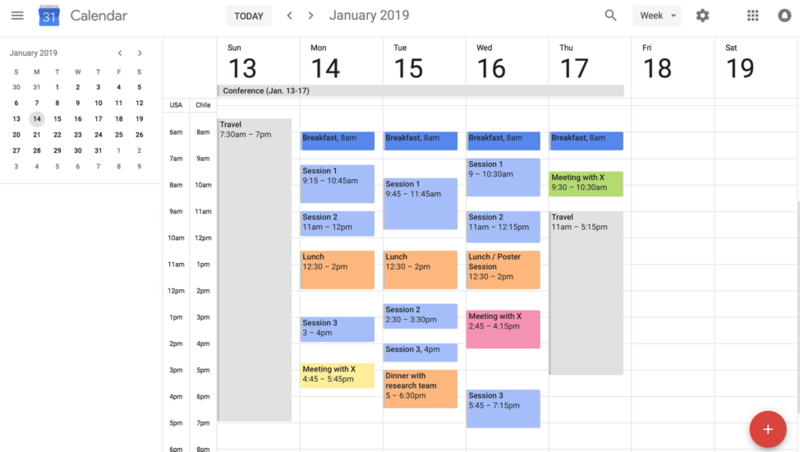 To get organized, you can use the conference app or go to Google Calendar to schedule your sessions with details such as location, topic and presenter. This will save you some time from having to reference the booklet that is provided once you get to the meeting. Utilize the Cochrane Buddies! – Buddies can help assist attendees in answering questions, providing information, or advising on which sessions to attend. Take Notes – You should take notes on any interesting points, important concepts, or questions that arose during the talk to help retain information about what you learned. Attend workshop sessions – I highly recommend attending workshop sessions. They are typically interactive and set up so that you work in groups with other attendees. I would suggest getting to these sessions early as they tend to fill up quickly. 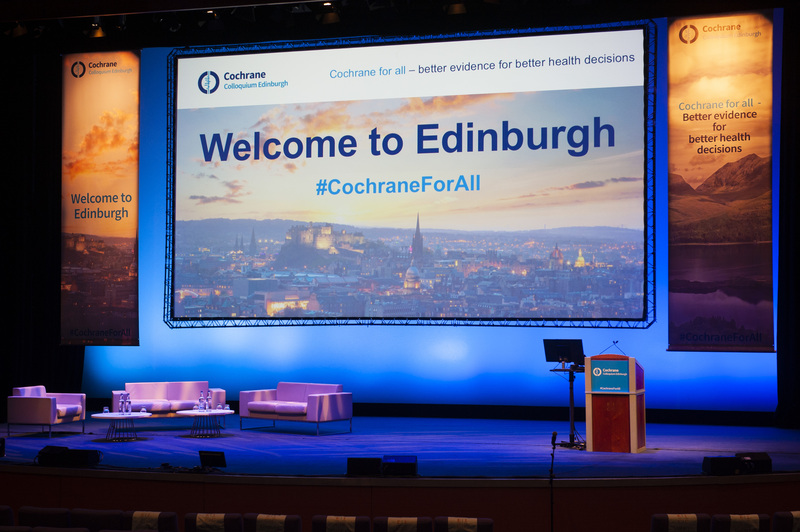 Learn about the host city – One of the great things about the Cochrane Colloquium is that it is hosted in a different city every year. Take advantage and explore the surrounding area if you have time. The meeting organizers typically offer a social activity for attendees. 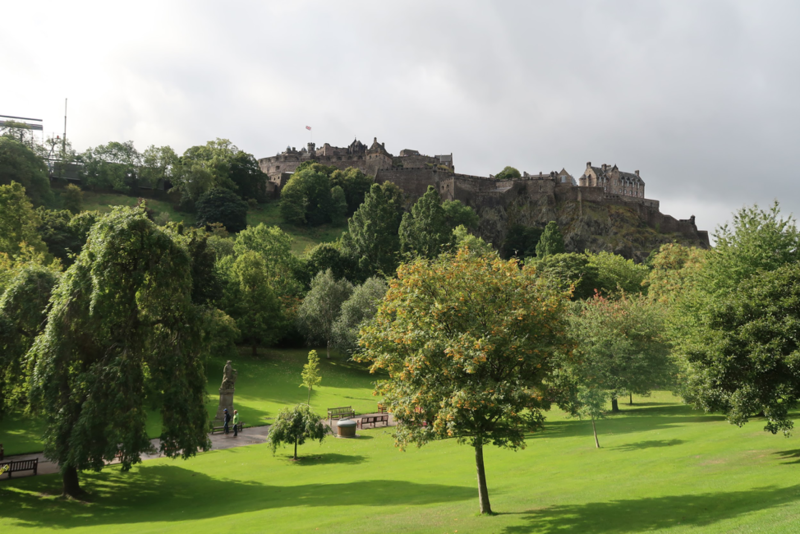 In Edinburgh, I took part in a walking tour led by a Blue Badge guide and got to learn a lot about Scottish heritage and culture! Reflect on what you learned – Be sure to compile your notes and summarize your main takeaway points so that you can reference them at a later point. It can also be helpful to share what you learned with other students in your lab/department during department meetings. 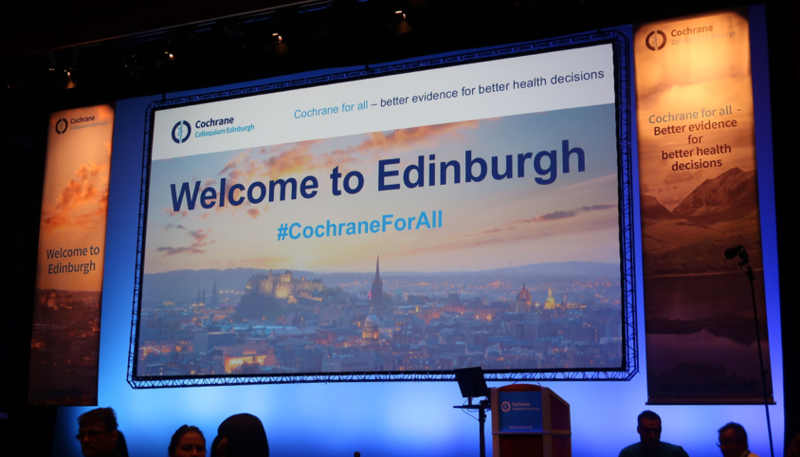 The Cochrane abstracts are also published online so that you can view and share them after the meeting. Follow up with contacts made during the meeting – Send a quick follow-up email to new contacts and colleagues made during the meeting! Editors note: In 2018, Cochrane UK also hosted a Student ‘Fringe Event’ the day before the Colloquium. Sarah submitted a brilliant video, explaining the PICO (Patient, Intervention, Comparator, Outcome) Framework which won her the student competition we ran for the event. I’ve shared it again here as it is a great resource to be aware of! You can also read more about Sarah’s experiences with Cochrane in this “30 Under 30” blog, which is part of a series of blogs highlighting the involvement of young people working in Cochrane.